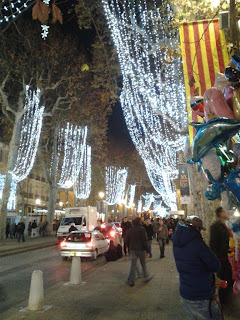 Here we are in that last shopping week of the year, when you would think we are all tired of shopping, but in fact, Aix is hopping with shoppers and window-lickers (in French, window-shopping is the highly descriptive window-licking, lèche-vitrine). The little huts in the Christmas market are still up and open for business, as are the children's rides, and the holiday lights continue to shine. I have not seen much by way of after-Christmas sales, although after Christmas appears to be the beginning of the sale season for household towels and linens. Shopping these past few months has shown us how the retail trade here appears to be much less in favor of the client or customer than we are accustomed to. We have had numerous social interactions with shopkeepers and clerks that seem to suggest that making the sale does not seem to be the top priority. Here are just a few examples. A few days before Christmas I stopped in at a local specialty wine/food shop that I have patronized several times and which was open earlier than usual for the holidays. This is one of those shops throughout France that is closed at lunch, (pity the lunch time shoppers), and which opens late on Mondays or not at all. I was hoping to purchase some wine accessories and asked for a particular color that I had seen in the shop window. You'd think I was asking for the world, given the responses from the sales clerk and the matron positioned behind the cash register. And then when the item was located elsewhere and rung up, neither offered to gift wrap my items, yet such service was offered to me previously. (This also happens to be the shop with ne pas toucher signs all over; don't touch the goods!) In Paris last week, we were at a shopping center along Boulevard du Montparnasse that was open until 8 pm, and while standing in a check-out line at one shop, we noticed that the security guard stationed by the front door was turning away customers already at 7:30! (So the sales staff would not have to work too many minutes past closing time?) Another time, a few months earlier, I needed some assistance at the local Monoprix department store in Aix. After I finally understood that I should go to the accueil (welcome desk), I was stunned to find the grumpy woman there shaking her head at me and telling me she could not understand me so therefore could not help me. Now, why would the staff at such a store in a town like Aix, that attracts lots of tourists and is full of international students, not be able to offer a friendly welcome and make an effort to understand its customers, regardless of the language barrier? It's a little surprising that she was not able to speak English since I've had the experience elsewhere in Europe where large department stores specifically hire multilingual sales staff. Maybe the customer service clerk chose not to speak English!? We've had several instances when that has happened, when we have muddled along in French and strained really hard to understand some important transactional details that were being explained to us, only to discover that the clerk could speak and understand English. For example, we struggled at our bank branch for many months, and on one visit, the bank manager suddenly said something to us in flawless English. Our jaws dropped, and then closed, and we have never heard her speak English again. Of course, we WANT to use French as much as possible, but sometimes, especially in matters like banking, if some important point could be clarified in English, like the fact that we have a limit on cash withdrawals each week, we would be ever so grateful! On the other hand, I've had some examples of superb customer service. Just this week, a friendly frame-shop owner patiently listened to my mangled French, helped me select a simple frame/mat for a large photograph of Aix that I had brought to her shop, and agreed to frame the print in less than 24 hours! I received a text on Christmas Eve morning that the gift was framed and ready for pick-up, and it was beautifully wrapped for me. Similarly, a few weeks before this, I stopped in at a linen shop for some French linen rideaux (curtains) for the front windows of our new apartment. After some exhaustive discussions with the kind young shop clerk (whom I didn't understand fully), I purchased a sweet set of white linen roman shade style curtains edged with lace for the kitchen (they attach with velcro, so the inward-opening windows are not obstructed), and 2 long linen drapes in alternating off-white and beige stripes with ties at the top for the salon/salle à manger (living/dining room). I was already sighing with happiness about the exquisite linen I was buying when the store clerk surprised me by telling me that I could return my curtains for a store exchange, if they for some reason did not work out. (That is the only time I have ever been apprised of a return policy at any French shop.) Needless to say, I shall give these shops my future business, and I even popped in the next day to thank the young sales associate after I'd successfully hung my drapes. Another place I take my business regularly, even though it's out of my way and is not our regular branch is to the Aix post office just outside the old town. I truly enjoy going there because the staff are friendly, patient, able to understand broken French, and plentiful. Not bad for a branch of the civil service! Finally, to be fair, I am happy with the grocery delivery service at Monoprix, and I do shop at the store regularly. We've had good luck and bad luck with several other delivery services, because apparently, delivery to one's front door is not necessarily automatic, if you live on the troisième étage (fourth floor). Clearly, just like in other places, there is good customer service and there is bad customer service. What seems to be different from our shopping experiences in the United States, where the customer is always right and poor customer service is a death-knell for business, is the feeling that some French retailers do not care about their customers. Yet, these shops remain in business, some for a long time, and the French patronize them. That suggests that there is perhaps something else going on, that goes beyond basic economic principles, something more...yes, sociological. That is, shopping, here and elsewhere, may be governed by different kinds of social rules. Making shopping easy for the customer, being personable or even grateful, these are simply not a necessary part of the interaction between seller and buyer here. The French also perhaps appreciate and look for certain quality markers in their shopping more so than we do in the States. For example, there is a baker in town who attracts customers not because the customer service is terrific but because he has the prestigious Meilleur Ouvrier de France title (see the wikipedia entry explaining this uniquely French status symbol: http://en.wikipedia.org/wiki/Meilleur_Ouvrier_de_France) Other shops may sell small batches of artisanal or French-grown products or they may have a well-known family name associated with their business. It may be that the French simply value these marks of quality or status more than they do customer service with a smile.